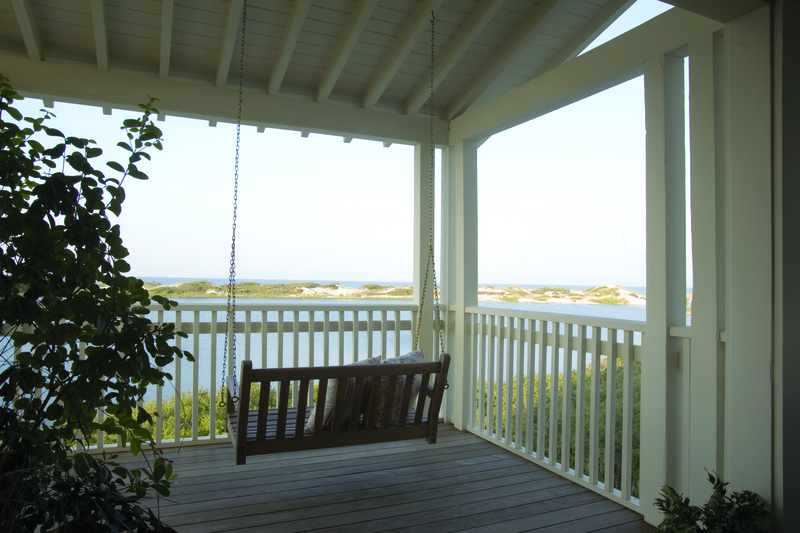 A porch swing at a home we designed. The perfect place to curl up and enjoy a good book and a glass of wine. Enjoy your weekend! A few years ago I worked with a family on their new home in Watercolor. They had 2 little boys. The boys were to share a room in the front of the house. They love “color and the beach” were my directives. So I started with 2 twin iron beds then found the great antique pine nightstand for between the beds. In a thrift store I found this vintage crab trap lamp that I had rewired and added a new shade which added a touch of whimsy. The lamp along with the vintage life preservers, fish pillows, and buoys completed this simple nautical look. 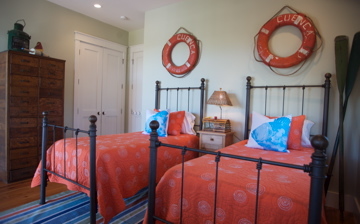 The orange quilts added the color to the bedroom in this beach cottage. Hi! Paige here. Remember when MTV first aired? I do. Remember the first video? 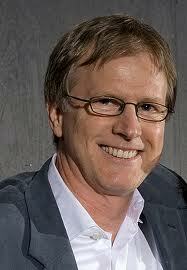 (It is Video Killed the Radio Star by The Buggles… great to remember for Trivia night). Check out this list on Wikipedia of the first videos aired on MTV http://en.wikipedia.org/wiki/First_music_videos_aired_on_MTV . You are probably wondering where I am going with all of the MTV references. Well, this week in Rosemary Beach, where our shop and studio are located, you have a chance to remember the 80’s all week long. The MTV VJ Alan Hunter, one of the first 5 VJs on MTV, will be broadcasting his radio show, Siruis XM’s 80’s on 8 http://www.sirius.com/80son8 , from Rosemary Beach, Florida. It should be a fun week of music to remind you acid washed jean, big hair, Molly Ringwald, scrunchies, ET, The Cosby show, etc. I am working on a play list for the shop and studio of 80’s music for the week. It is fun to look back and remember the songs that I roller skated to with my best friend, Haiden, every Friday and Saturday night at the local roller rink donning knee socks and pig tails and later perms and VERY large bangs (sorry no photos of the bangs). Every song I see on itunes bring backs more memories. So far on my play list I have Chicago, The Bangles, Pat Benetar, REO Speedwagon, Duran Duran, Michael Jackson, John Wait, Bon Jovi, Madonna, Cyndi Lauper,Boy George, Billy Joel, Wham, etc . I could go on and on with the list but I will stop at some point. What was your favorite song from the 80’s? Hot and Hot's vintage mosaic tile floor dates back to the 1950's when Caddell's Creamery occupied the building. The mosaic tile floor at Birmingham’s Hot and Hot Fish Club is almost as good as the Tomato Salad there this time of year. Almost. Hey Tracery fans, Doug here–I enjoyed a delicious dinner at Hot and Hot last night with some great new clients we’re excited to be working with. Between good conversation and delicious food (prepared by our dear friend Chris Hastings, who’s also the Culinary Advisor at the SpringHouse Restaurant we designed at Lake Martin) I was reminded about how much I love the wonderful pattern and colors of the vintage mosaic tile floor at Hot and Hot. In an otherwise neutral space the floor really stands out as a classic and energizing design element. 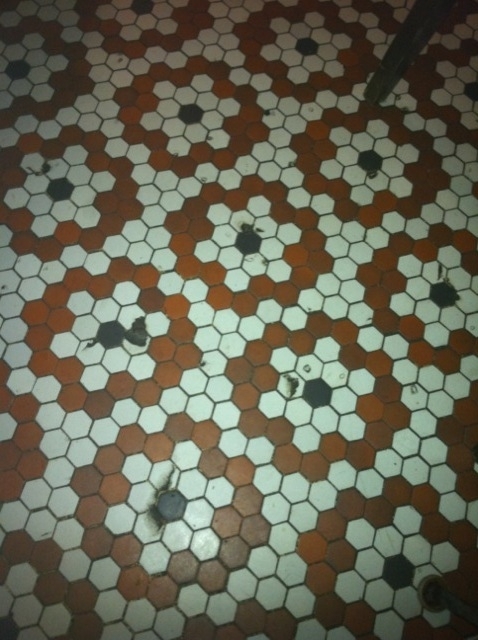 After college, I rented a 1940’s apartment in Mountain Brook Village for a few years and the bathroom floor was covered in a tiny pinwheel pattern mosaic of black and white marble. Walker Zanger has reproduced this classic pattern perfectly in their Imperium collection, pictured here in Bianca Cararra. Another really fun and vintage look is pennyround tile. About the size of, you guessed it–a penny, this tile feels really old school when installed. We love it on the floor but have installed it vertically on walls too. Pennyrounds come in lots of fun colors and many feature variegated shades like the American Universal Corp tile pictured here. We love 2″ herringbone tiles for bathroom or shower floors. 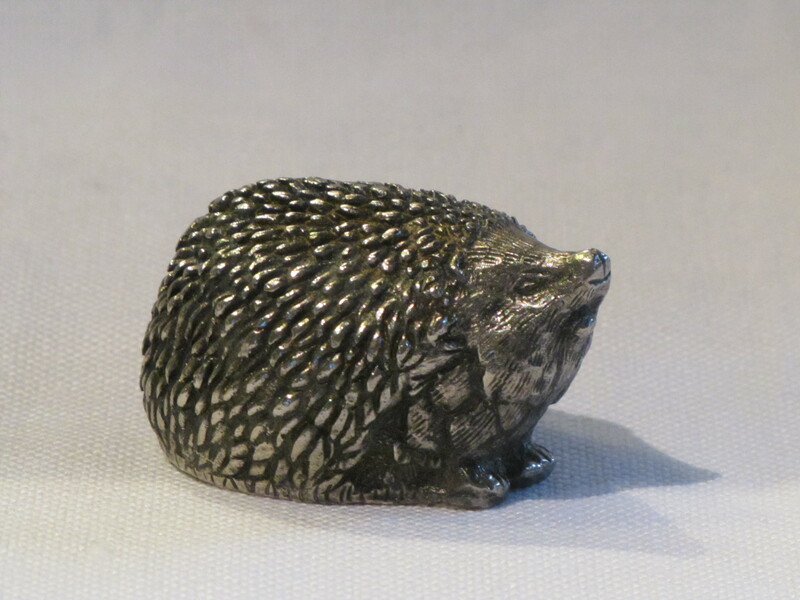 The size is still small enough to feel detailed and vintage but it large enough to not be busy visually. Akdo’s Blue Lagos Hexagon is one of our favorites to use — the varied shades of charcoal grey found in the stone give great depth to this mosaic. Another Akdo mosaic we can’t get enough of is their Calacutta Herringbone. We think this tile is so elegant and chic! Imagine how good this would look bordered with 12×12 Calacutta tiles to form a ‘rug’ in the center of a large bathroom. Not all mosaics have to be neutral…Waterworks has several really fun colorways in their Penny Tile collection including this pastel blend that we think would be great in a bathroom for kids. So what’s your favorite mosaic tile look? Classic and crisp or fun and funky? We’ve been working on a master bath renovation in the beautiful Mountain Brook area of Birmingham for the past couple of months and the project is finally at that exciting point where things are starting to come together. Although the house in question is an amazingly untouched 1920’s Tudor, the master bathroom had been unfortunately remodeled in the 80’s. Lots of brass, lots of angles and lots of faux finished marble. Everything had to go. Among the details we’ve restored to the room is trim casing around an incredible wall of original leaded glass windows. 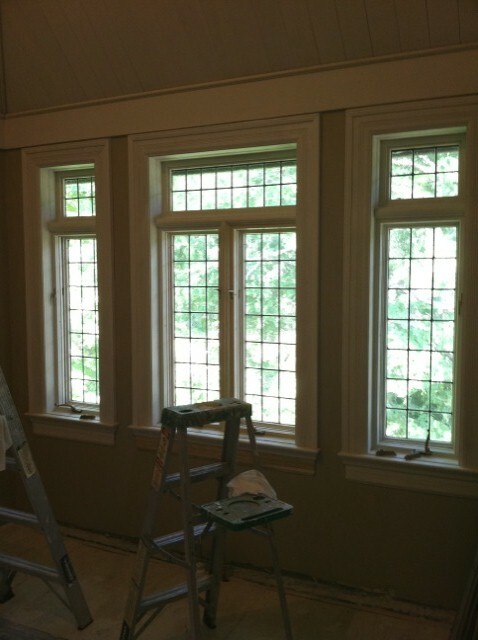 The original window trim had been completely removed during the previous renovation however the very talented crew at Francis A Bryant & Sons (the project’s general contractor) have managed to match the trim exactly–restoring these windows to their previous glory. A freestanding tub will eventually be centered upon this wall, making a grand new centerpiece for the room. One good decision that was made during the room’s previous remodel was to vault the ceiling up in to the attic space. Although the volume of space was a nice and unexpected touch in the room, the ceiling was unfortunately covered in boring drywall. We feel really strongly that architectural features like vaulted ceilings need to be treated with materials that make them feel special and intentional. 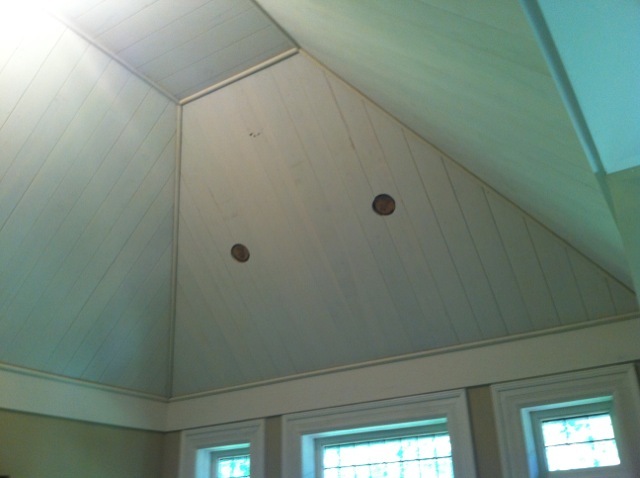 To improve the ceiling in this room, Doug called for tongue and groove 1×6 boards on the entire ceiling surface. What was once a forgotten surface in the space is now becoming another very important design element. The ceiling in the adjacent master bedroom is receiving a similar treatment, visually connecting the two spaces. A stunning herringbone marble floor starts getting installed today…stay tuned for more photos! Hi! Paige here. 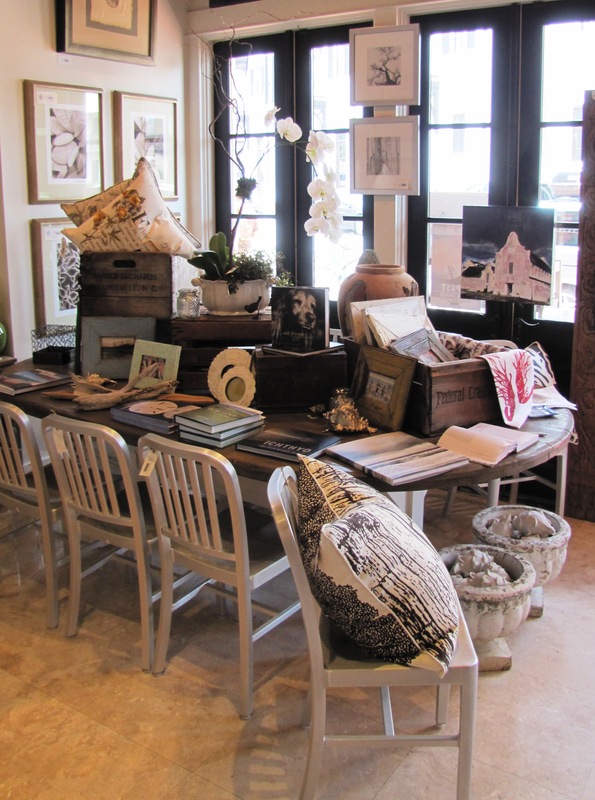 I was out of our Rosemary Beach studio/shop most of the week last week. When I returned, the girls (Anna Kay, Bess, Heather, and Lizzy) had rearranged the shop to include all our fun new items. It was like Christmas in July! 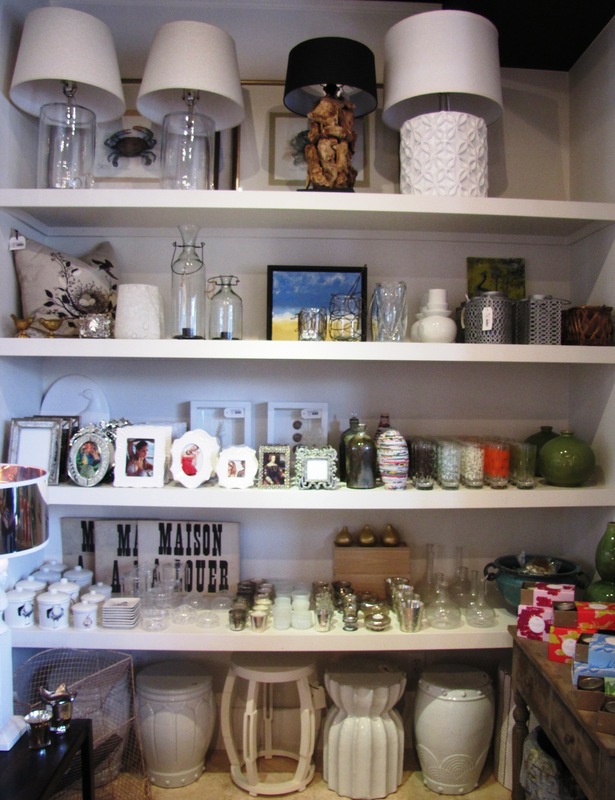 I love to walk around the shop and see all the items in their place… well their temporary place until someone takes them home. I thought I would share a few of my favorite corners of the store right now. I hope you all enjoy! I love the contrast of the reclaimed oak dining tables with the modern aluminum chairs. So many books and other treasures to be found here! LOVE all our new picture frames! They are a great gift for a wedding, birthday, or just to tell someone you are thinking of them! The white farm table mixed with the clean glass lamps and a vintage box filled with fun finds (my favorite is the vintage level). Tucked underneath are our custom stools/side tables made of reclaimed beams from barns and warehouses. This image really reflects our philosphy of mixing old, new and vintage with clean lines and great crunchy textures. Ha! You even get a little peek at me in the photo above! This antique dough bowl full of shells is ready to go home with someone special. I can see it on a great white carrera kitchen island. 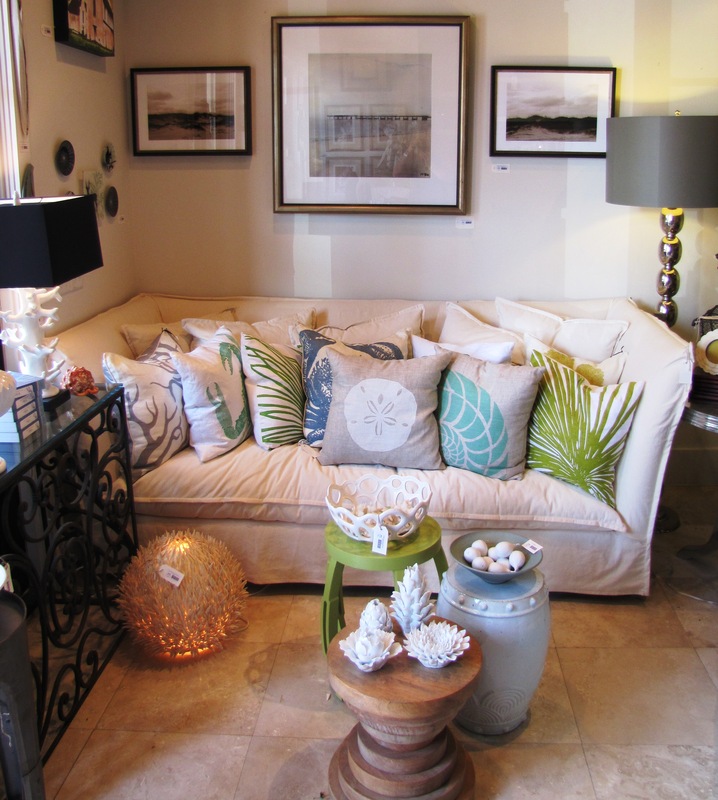 This really COMFY slipcovered sofa looks great with all of the "beachy" pillows that just invite an afternoon nap! 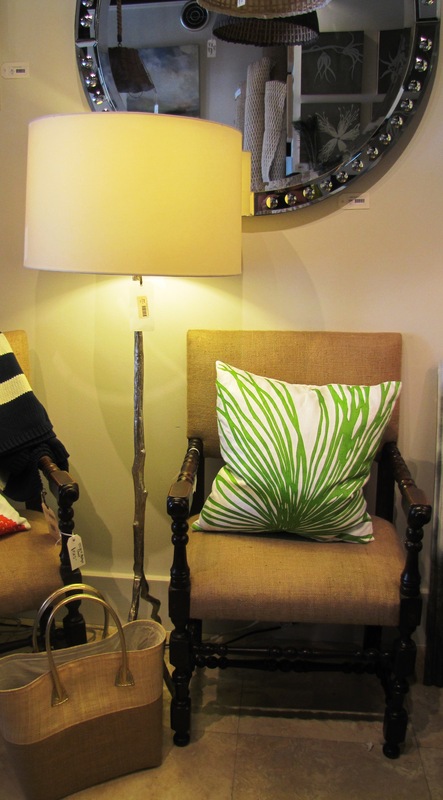 love the pairing of the antique chair recovered in burlap with the "tree" floor lamp and the round dot mirror. Maybe I should leave more often! 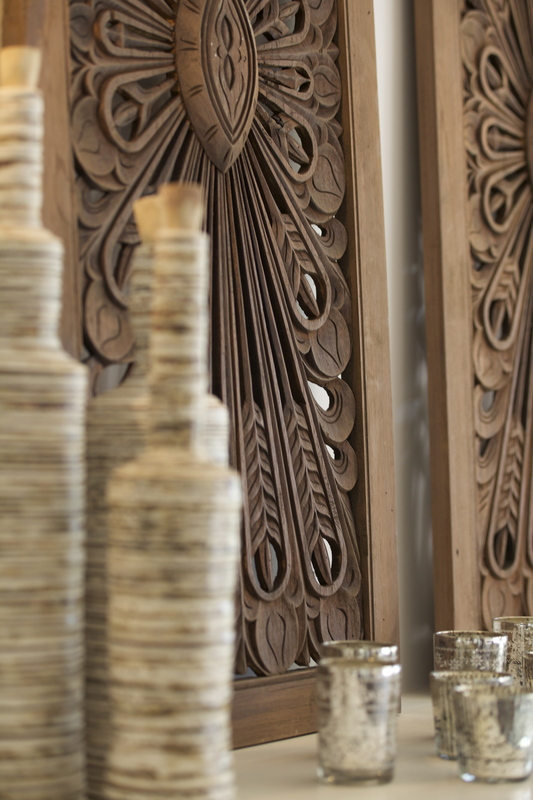 It sure makes it fun to return to a new look at our shop!